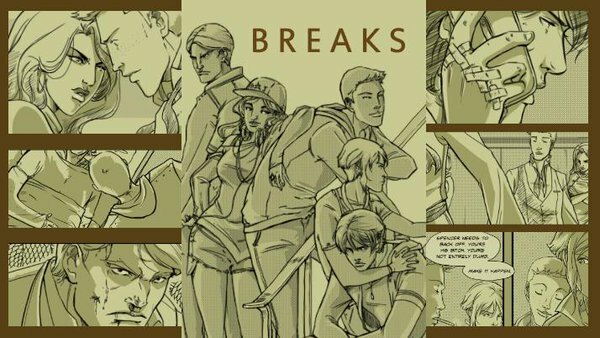 Breaks is one of the best comics being published in English right now. A web serial, it follows the complex, funny, occasionally violent knots that a group of teenagers tie themselves into. At the center of each of those knots is Cortland and Ian. Not quite friends, not quite enemies but connected in ways at least one of them isn’t really prepared to look in the eyes, their relationship and how it deepens is the engine that drives the book and one of the smartest, best realized romances you’ll find. 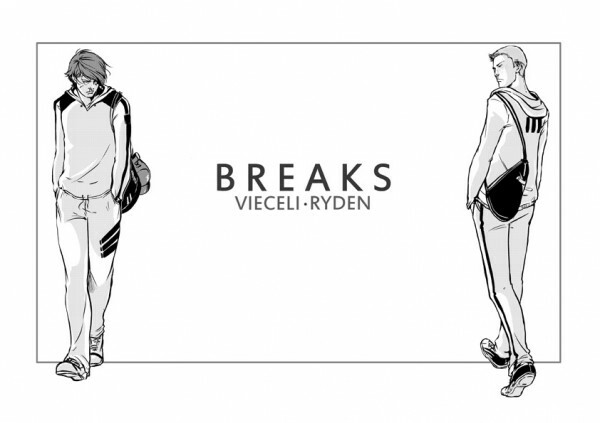 Breaks is celebrating it’s 2nd year and I had the pleasure of chatting to creators Malin Rydén, and Emma Vieceli as well as…some other…people you’ll meet in a later post about it. But first up, Malin and Emma. So, first off, introduce yourselves, and what you do. I’m Malin , queer swedish author and one half of the writing duo of Breaks. My main task is to break down our original book and transform it into a workable comics script. Hi, I’m Emma Vieceli. I’m the other half of the writing duo of Breaks. I take Malin’s amazing breakdown scripts of our book, make any minor tweaks in my edit pass, and make the comic from them. Malin: A few years back I wanted to get better at writing in the English language. Since I am originally a horror writer, I also felt that I was a bit weak in the dialogue/romance/action department. As I had recently been playing Dragon Age II and really connected to the way dialogue was handled there, I decided to have a go at writing fanfic for it. This way I would get an immediate connection to readers and see what worked/didn’t worked. Being an author is a lonely job, but it turned out that writing fanfic made it decidedly less so. Emma: Malin claims she wanted to get better at dialogue and emotion, but that’s what drew me to her writing when I first encountered it. As she says, we were readers of each others’ writing online, completely anonymously, so I had no idea that she was a published horror writer. I didn’t even know she was Swedish – her English was THAT GOOD. We occasionally commented on each others’ stories, but – again – all under handles, never with our real names. So the initial attraction really was all about the writing. We wouldn’t actually meet in person until years later. And, in fact, we’ve only ever met up in real life maybe three times now; which seems bonkers. Malin: Do you want to field this one Emma? You are after all the key player here. So – after finding each others’ writing, we had got talking with a small group of writers online. Most wrote fanfic already, but were keen to take things further. I was between projects at the time and in need of some creative motivation, so when the group suggested we try opening a scenario into which we could all bring a character we’d written, but didn’t have a plan for…it seemed a good idea to try. It was totally pressure-free and still anonymous. So a great chance for me to create without drawing and without work pressure. I brought to the group a character called Cortland. I’d had a vague story idea in my head for a while, but wasn’t intending to go anywhere with it really. He was a perfect fit for a collaborative writing project. I’d never done anything like it before, preferring to control my own stories, and so I was a bit rubbish at first; just writing my own sections solo. 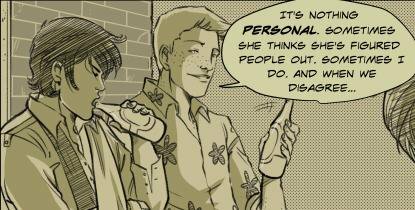 but Malin (who’s name i still didn’t know then) pretty much dragged me into some collaboration when her character – a lad called Ian Tanner – started interacting with Cortland’s story. That was it. Cortland started making friends (and enemies) in the group and it got addictive. Each writer would write a paragraph or two in third person, leave it, and when they came back, another writer would have picked it up and added to the scene. The nature of it means that personal stories were often drailed and had curvebals thrown at them. And Malin and Ian threw the biggest curveball ever at Cortland. Suddenly his story went from being just the dark drama that I’d thought out, and into a very unexpected romance. And it WORKED. SO. WELL. It completed the story. Well, eventually, after Malin and I had sort of broken off a bit and ended up writing a novel’s worth of this story with no communication outside of it at all, we unmasked. I told her I was a comic artist and that I thought we should make a comic of this. She told me she was a Swedish writer and loved comics. Why go digital for something like this? Emma: Yep. As Malin says – the feedback on a story like this is so key. It’s such a real story. But also, practically speaking, I can only work on Breaks in my spare time around my work contracts. Releasing a page a week online has really given me constant targets and motivation to keep working. Longform projects are hard to keep motivation for when you’re not sharing them; especially when we didn’t want to print issues, but save up printing for the compiled book. Web format is perfect. And I think we’ll see more projects like this. I’m about to start art duties on DC’s Supergirl, which is running as digital into trade. Obviously, Malin and I have done it for free – which is maybe crazy – but I do believe in the model. What does that do to your workflow? And how far ahead is Breaks created? Malin: There are three answers to that question. The first one is that Breaks is already done. We have written the book after all, and though it is changing a lot in its transition to a comic, we already know where the characters will go and the broad strokes of what will happen. The second answer is the script. That goes in spurts. 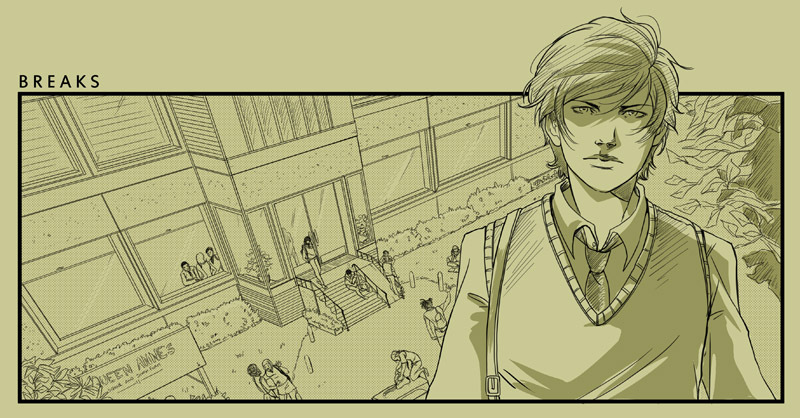 Volume One (issue 1-6) is already written and drawn (we are approaching the end of issue 5 online). Volume Two (issue 7-12) is planned and plotted, and I am currently writing issue 9. I try to stay at least a full issue ahead of Emma, so she has time to think about her changes to the script. Emma: …And the third part of the answer is the pages themselves 🙂 I’ve been working hard to keep a safe buffer of around twenty pages in hand. It’s utterly necessary for me, as my job means that there will be times I’m on deadline and can’t think about Breaks. We’ve not missed an update in two years and I’m very proud of that ^_^ As we write this, I just finshed drawing out arc one. I can’t wait to dive into arc two. How did the comic change from planning to the page? Malin: It’s changed a lot from the book, that’s for sure. Some characters have been removed entirely, others have been fused together and turned out more interesting as a result. When we plan the outline, we often have to skip entire story arcs just because we don’t have space to fit them in. 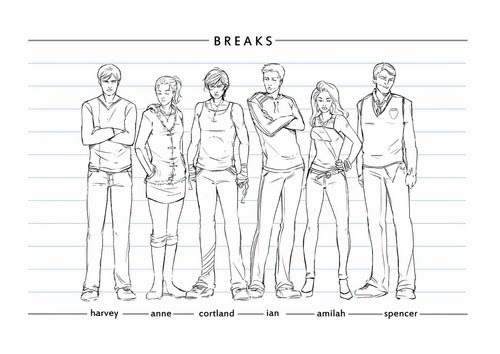 I am still sad the snowstorm arc had to go, but we could salvage the best beats from it and use it to fill in other bits of the story. Adding to that, when I write the script from the outline, I often find that I have to add scenes that didn’t exist in the book at all, just to make things flow smoother. Or, well, sometimes just because I want to see Emma draw them… Once the script is done on my end, I send it off to Emma, and she’s got free hands to do whatever she wants with it. Is it changing as it’s going on? Malin: Yes, it is. Not the major story, but some character beats are starting to change as we get used to this new version of the surrounding cast. And small changes escalate as the story goes on. Emma: Yeah. I think Cortland has changed a fair bit since the book. Often, he and Ian were occupying a similar space as characters in the novel; which seems hard to believe now. The balance is much better now. As we spend longer with the characters, we learn better how they think. I love the way you’ve structured it. Not just the flash forward at the start and the flashbacks to Cort’s past but the moments of quiet and stillness. Do you approach the big emotional beats differently? Malin: Well, I try to think of pages and reveals. Each page is a pair in the future printed book, and they have to work together. I also like cliffhangers, which I suppose our online readers will have noticed by now. But as for the emptional beats, I like poetry. And poetry is all about explosions and stillness. I try to think of the script as music, and vary the intensity of it all. I always did love that when I wrote books, but I had underestimated how it would feel writing with someone who could transform these feelings to the page. Emma is wonderful when it comes to that. Her sense of pacing on the page, the way she structures panels, the way she plays with light and dark and background texture is nothing short of glorious. Emma: Gawsh. Malin’s ability to scene shift at just the right moment is amazing. I’m constantly amazed at the way she’ll insert a new scene into the mix that takes the emotional line exactly where it needs to be. And it helps that we’re both in the heads of these characters so much. I can see through dialogue she’s written to see exactly what she means in what’s not said, you know? It’s a dramatic story and it has a lot more drama to come. But the drama means nothing without the quiet in between. We always knew we wanted to take our time with this story and give it the pacing it deserved. We’re so glad it works for readers! Likewise, for a book that’s intensely violent in spots, there’s real tenderness, in both sense of the word, to the relationships. You buy absolutely that these teenagers are locked together in the pressure cooker of school and doing what they can. Is there a relationship that surprised you? Or a character who’s elbowed their way to the front? Malin: We haven’t seen much of it yet, but I always was so amused at how Ian and Irena worked together. I really, REALLY hope we will have time to get the pony in there somewhere, because I am still cracking up just thinking about it. Emma: Man, I’m so glad to hear all that comes across. Yay! And oh yessss! Irena and Ian are hilarious together and I can’t wait to get to more of their connection. As for the extra connection Cortland will be making… that’s going to come as a surprise, I think. I’ve also been amazed at how enjoyable Amilah has been in the comic version. She’s the brains of the group, I think, and readers have really responsed well to her. I take it as a great sign that, for all that readers want Ian and Cortland to be happy, they also feel bad for Amilah. She’s amazing and far from a throwaway plot device. We care about Ian’s choice because we care about her. Malin: Well, if I exclude Ian and Cortland (who are favorites by default because why would we write about them otherwise) I have to say that my favorite character has not shown up yet. So I can’t name them. But of the ones that we have seen so far, Amilah is very close to my heart. Emma: And I’ll even it up and go for Irena 🙂 Obviously the boys are the key to it all, but I love Irena’s character, and I think she’ll resonate with a few readers in her own way as we go on. Now we’ve had what could only be described as The Moment, where does the series go from here? Emma: cackles oh yessss, precious, yessss. Ahem Yes. The course of love won’t run smoothly for these two, but their relationship will become a rock they cling to when other aspects of their lives become the harder things to deal with. Malin: Currently on the top of my list of projects other than Breaks, is an online choose your own adventure game with the working title ‘Fallen Hero’. Programming is a fun break from writing at times. Book wise, the main project is still ‘Crap Dad’, and I have no idea how I will ever manage to settle on a serious title for that one, because it just sums it up so perfectly. And one day, Emma, we should really finish off ‘The Grey‘, but it’s sadly been pushed to the side since we started working on Breaks. Emma: We really need to finish The Grey, yes! There are always so many projects and never enough time. I’ve just come off of the Eighth Doctor mini series with George Mann for Titan comics, and will be spending some time with writer Sterling Gates on DC’s Supergirl series very soon. Exciting times! I’ll also be returning to Alex Rider’s world for Walker Books, with Scorpia having just been released recently. But Breaks is the underlying project throughout it all. Arc two is going to ramp up the stakes and we can’t wait to share. Thank you so much to both Malin and Emma for taking the time to talk to me. We’ll have more Breaks content later this week but before then, go and read the comic, it’s great.